This post is to highlight several biblical “latter day” prophecies which receive little or no attention even though they have been accurately fulfilled. Isaiah 1-4 is a prophecy for conditions that will prevail in the latter-day nations (Isaiah 2:1) of the “house of Jacob” (Isaiah 2:5). When the Bible uses the term “house of Jacob,” It refers to all twelve of the tribes of Israel. The term “house of Israel” refers to the descendants of the ten tribes of Israel, and the term “house of Judah” refers to the modern Jews/Israelis (see my free article, Four Reasons the Jews are Judah). It is clear that this is the case as both “Israel” (the ten tribes) is referenced in Isaiah 4:2 and “Judah” is referenced in Isaiah 3:1 and 8). This clearly shows that this prophecy about the sins of all the tribes descended from “Jacob” refers to all modern nations descended from the old kingdoms of Israel or Judah. Given than the modern ten tribes of Israel are dominant throughout the western world (as documented in my books and also my free article, The USA in Bible Prophecy), this prophecy in Isaiah is both a general indictment of the Israelite tribes for the sins that will permeate their latter-day culture as well as predictions about their overall culture. Isaiah 2:7 states that the latter days will be a time in which the tribes of Israel are quite wealthy, and that is consistent with the prophecy in Genesis 49:22-26 that the tribe of “Joseph” (which includes both Ephraim and Manasseh) will experience an outpouring of the blessings of the “birthright” promise given originally by God to Abraham’s descendants (Genesis 17:1-7, 22:15-18). This “birthright” blessing was passed from Abraham to Isaac (Genesis 21:12, 26:24), then to Jacob (27:26-29) and finally to the sons of Joseph (Genesis 48:14-21). This birthright blessing of national power, numbers, wealth, etc. has remained on the tribes of Ephraim and Manasseh ever since. There is no doubt the prophecy in Isaiah 2-4 applies to the modern nations descended from the original twelve tribes of Israel (another name for “Jacob” – Genesis 35:9-10). In Isaiah 2:7, one of the prophecies about the nations of Israel in the latter days is that there will be “no end to their chariots.” Keep in mind that the ancient prophets had to describe what they saw in visions and revelations in the low-tech vocabulary of their ancient languages. They had no modern words to describe the modern machines and inventions that we take for granted. One example of this is Revelation 9:1-10 where the Apostle John does a credible job of describing modern tanks, helicopters and warplanes with terminology about latter-day weaponry with terms like “breastplates of iron,” incredibly loud noise emanating from their “wings,” etc. Isaiah described the modern personal conveyances he saw in his revelation about the latter days as an endless number of “chariots”–ancient personal conveyances that were drawn by horses. Today, our modern conveyances are powered not by horses, but by the horsepower ratings of their engines. This is a prophecy about an endless stream of cars, buses and trucks that Isaiah would have seen in vision or some type of revelation. Perhaps he saw scenes of gridlocked freeways in modern cities in his latter-day revelation which led to his choice of words. Isaiah’s prophecy is also paralleled in a prophecy in Daniel 12:1-4 where Daniel prophesied that in the “time of the end” (verse 1), “many shall run to and fro.” In other words, Daniel prophesied that the latter days would be a time when the masses could be able to travel widely and routinely. The fulfillment of this prophecy was made possible by the invention of the automobile, bus, train and passenger aircraft. The use of the word “many” means the masses would all have this ability to travel widely, not just the elites. This prophecy has been fulfilled as mankind’s fund of knowledge led to the high-tech inventions of the latter days (the knowledge explosion which would lead to the development of the technologies to permit widespread and easy travel was also foretold by Daniel in verse 4). It has been a very long time since I’ve heard or read any mention in Christian works that focused on these prophetic fulfillments. Many biblical prophecies about “the latter days” or “the time of the end” have been very literally fulfilled in our modern age, confirming that only a Divine Supreme Being could have inspired such prophecies millennia ago and also brought them to pass in our time. Isaiah 41:21-26, 42:8-9 and 46:9-11 all record God’s challenge to mankind to see his ability to bring biblical prophecies to pass as proof of his reality and sovereignty. Clearly, God has passed this test. For much detail regarding biblical prophecies about the latter days that have come to pass in our time, please read my free article, Are We Living in the Biblical Latter Days? I suggest that readers review the entire prophecy about society in the “last days” in Isaiah 2-4. 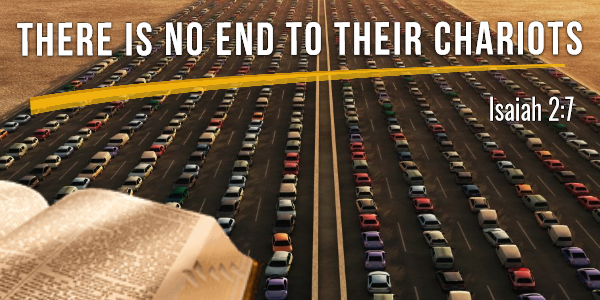 Not only does it include the prophecy about an endless supply of cars, buses, trucks (i.e. “chariots”) in the latter days, it also very soberly includes God’s indictment of latter-day society for the sins that he sees in it. Isaiah 2:8 prophesies widespread idolatry as mankind will “worship the work of their own hands.” Modern mankind has invented all kinds of modern technologies and people “worship” what we have invented. See the adulation of the masses each time a new upgrade of smart-phone is released as one fulfillment of this prophecy. Another would be how we “worshipfully” care for our new cars or how mankind exalts itself for discoveries of how to venture into space, discover the building blocks of life in DNA, invent computers and AI robots and devices, etc. Not only is the worship of God increasingly rare in our modern societies, the very consideration of a Supreme Creator Being is itself very rare. Modern mankind has truly reached the time when it “does not want to retain God in its knowledge”–which is itself another fulfilled prophecy from Romans 1:28. Isaiah 2-4 also prophecies the rarity of strong and wise leaders throughout all levels of society (Isaiah 3:1-3), a culture indulgent of its youth (Isaiah 3:4-5, 12), a very open “gay rights” movement (Isaiah 3:9), a feminism (Isaiah 3:12), political leaders (“princes”) who love bribes (Isaiah 1:23), huge income disparity (Isaiah 3:14), etc. As you read Isaiah 2-4, you will see a very accurate prophecy about civilization in the modern western world. Isaiah 1-4 is a prophecy inspired by God regarding what he revealed would be the sins of latter-day civilization. Have these characteristics come to pass in our time? They surely have! This prophecy also includes some of the divinely-sent punishments that would be triggered by these societal sins. Expect God to become more active in his dealings with mankind as we hurtle toward the conclusion of the latter-day period of time. You may want to read Revelation 11:3-13 about two incredibly powerful prophets that God will send to witness against latter-day mankind for its sins and call people to repentance before God’s age-ending judgment falls on the entire earth. Mankind ignores God almost completely in the modern world. It does so at its own peril.